The Tiger Who Came to Tea is stopping off via Channel 4 new with a newly commissioned hand-drawn animated special, continuing the celebrations of its 50th anniversary last year. The special, produced by Lupus Films and HarperCollins will air as a festive treat this year, and follows the success of the channel’s last festive special when We’re Going on a Bear hunt became its most watched programme of 2016. Written by Judith Kerr OBE, who celebrated her 95th Birthday last June, The Tiger Who Came to Tea has sold over five million copies since it was first published in 1968. Inspired by Kerr’s daughter Tacy, the story of Sophie and her extraordinary, stripy tea-time guest has enchanted generations of children to become a timeless classic. The 30-minute special animation will air on Channel 4 next year. 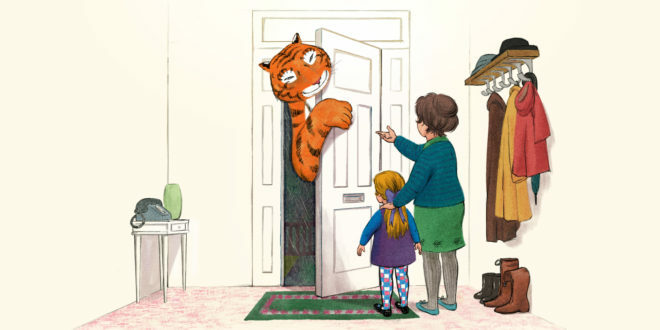 Caroline Hollick, Channel 4 head of drama, said: “The Tiger who came to Tea was one of my favourite books as a child, and I loved reading it to my own children when they were small. Chloe Tucker, commissioning executive, Channel 4 Drama, added: “We are delighted to bring Judith Kerr’s iconic and much-loved children’s book to our screens. The Tiger Who Came to Tea is a timeless classic, and we hope this film will capture the same special place in every family’s imagination watching it. The Tiger Who Came to Tea was commissioned by Caroline Hollick, Channel 4 Head of Drama and Chloe Tucker, Channel 4 Commissioning Executive, Drama. The book has been adapted for the screen by Joanna Harrison (co-director We’re Going on a Bear Hunt, co-writer and art director The Snowman and The Snowdog). This new animated special will see a team of artists bring to life Judith Kerr’s vivid illustrations in Lupus Films’ distinctive, hand-drawn animated style. UPHE Content Group is managing the international TV distribution, home entertainment and theatrical rights to the special.